Great parade on May 9 for the 70 anniversary of the antifascist peoples victory. 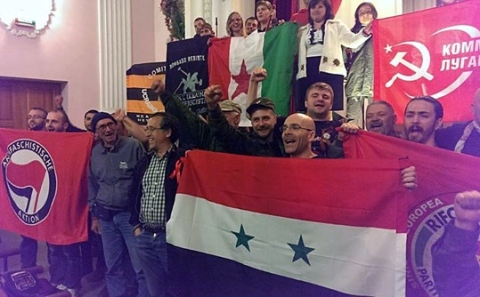 The Greek delegation participating in the 2nd International antifascist caravan Solidarity with the people of Ukraine-Donbass has had a very full program. The delegations and missions, a total of 150 militants from 14 countries arrived in the Peoples Republic on Wednesday, May 6th. On the first two days the members of the International Caravan and the Greek delegation visited schools, social kitchens feeding residents who are affected by the war, and production units under reconstruction in the city Alchevsk, accompanied by members of thePrizrak (“Ghost”) brigade and its commander Alexei Mozgovoi (the brigade defends the class nature of the war, and included a separate voluntary communist battalion). In a kindergarten, children had prepared a touching celebration as a reception of the delegation and we handed over part of the humanitarian assistance brought by the Solidarity Caravan. The caravan also visited the towns Stakhanov and Kirovsk where we came into contact with peoples’ militias fighting against the fascist regime of Kiev. 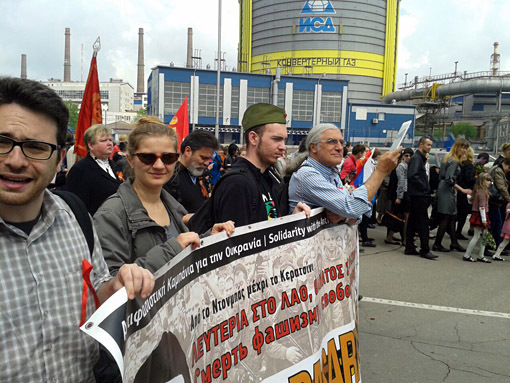 Of particular importance was the Forum in Solidarity with the people of Donbass held on May 8. 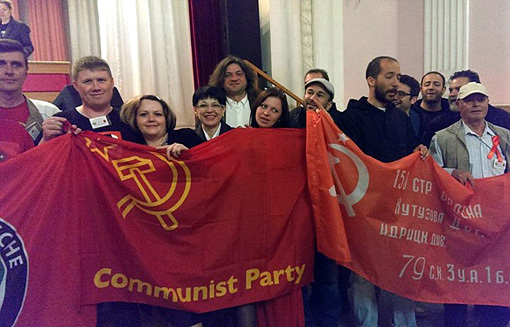 To appeal issued by the forces of the Left in Lugansk was aimed at the leftist forces “defending socialism, communism. All those who have chosen the revolutionary path of liberation of the peoples of the world from the yoke of neo-liberalism. ” With greeting and intervention in the processes of the Forum attended the NAR and KA. With greetings participated ANTARSYA, which emphasized its full sympathy and solidarity with the struggle of the insurgent eastern areas and the Ukrainian people. The Forum opened with a short speech by the military commander of the Prizrak (Ghost) brigade, Alexei Mozggovoi, who stressed the international importance of the meeting and noted that only those who fight for the honor and dignity can be considered free, with particular reference to the free voices that are not silenced. In the second part of the Forum was opened by the political commissar of the communist unit, Alexei Markov, who explained the difficult conditions in which the struggle of the communists who are based on the socialist perspective of the people’s republics is waged. Him and other fighters from armed militias described the reality and issues of the struggle. The interventions of organizations from a wide range of political standpoints focused on issues such as anti-imperialist and anti-capitalist struggle, anti-fascism, the need to defend the struggle of the Donbass and the struggle against the EU and NATO. The Greek Antifascist Campaign for Ukraine, opened the interventions by international delegations, while on behalf of the New Left Current for Communist Liberation spoke Paul Antonopoulos, a teacher trade unionist of “Intervention” and member of the Committee of public sector workers union ADEDY. Work was completed on Thursday afternoon with the adoption of a political statement. The actions and interventions of the International Caravan of Solidarity will culminate on 9 May, with the participation of delegations from 14 countries in the long march and parade in honor of the 70 anniversary of the great Antifascist Victory of the Peoples. A series of events and a parade has been prepared for days and become a crucial meeting for the People’s Republics and the region of Donbass, expressing the continuity of the struggle against modern fascism, encountered in practice in the area of ​​East Ukraine. This entry was posted in Solidarity and tagged antifascist, banda bassotti, donbass, Lugansk, solidarity. Bookmark the permalink.